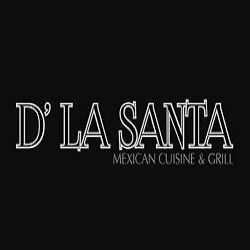 D' La Santa - We pride ourselves on being 100% family owned. We pride ourselves on being 100% family owned. A team of brothers, uncles, aunts and daughters serving grandmothers old recipes. Combined with new rustic and old traditional Mexican food we thrive to serve you the best traditional tacos, quality prime aged meats, margaritas and organic vegetables. Our Mexican restaurant is a completely different concept from others, with very emblematic dishes such as Chile en Nogada and Carne en su Jugo, served in our 100% handmade clay dishes. Our delicious flavor goes beyond Mexican borders, bringing them from Guadalajara to your palate. All our dishes represent a taste of Mexico from North to South, all these elaborated from the best seasoning of grandmother Maria Taide Sahagun. We'll make you feel at home as it will be offering a service like no other. Authentic Mexican and Mex-Mex cuisine, serving breakfast, the best shaken margaritas, Fajitas, and soft-shell crab. Catering & delivery are also available..